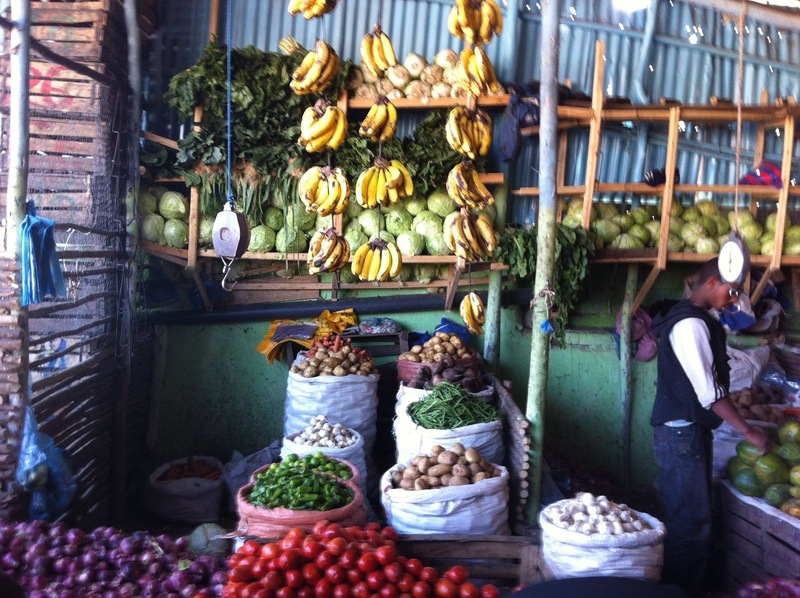 This is one of the fresh vegetable and fruit stalls at the Merkato, the largest open air market in Africa. All of the fruit and vegetables that we had were wonderful. It's amazing what a difference when things are picked and sold ripe. The carrots were especially sweet and we enjoyed bananas, watermelon, mangos, papayas, oranges (the peels were green but the fruit was ripe), beets, cabbage (multiple varieties), potatoes, onions and squash. Since you couldn't drink the water, all of the produce was soaked either in a mild bleach solution or potassium permanganate solution to disinfect them. Then allowed to dry completely before eating. 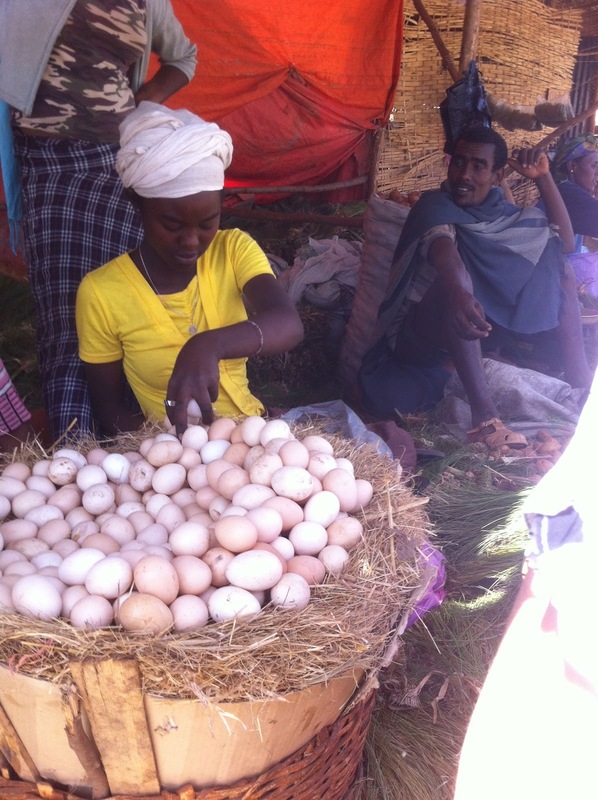 Eggs are a common form of protein and were generally available in even the small shops along the road. Like most protein, they were kind of expensive at 2½ birr (15¢) each. I thought it was interesting that when we were buying 15 eggs here, the proprietor got out her smart phone to figure out what we owed. She packed them in a plastic bag cushioned with straw. Coffee is one of the major exports from Ethiopia and there were a lot of coffee vendors. One of the local staff went with us to look for beans to bring back and we ended up visiting a lot of stalls before he found some that he was satisfied with. 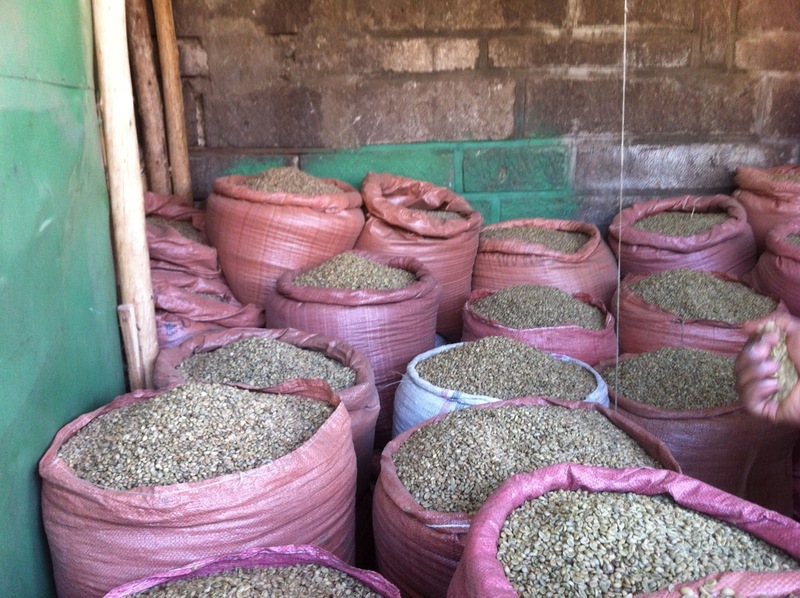 The beans are sold unwashed and unroasted. He was looking for beans from a certain area with a certain moisture content. He also tasted the unroasted beans looking for a certain flavor. Before coming back, we had a local family wash and roast our beans since we'd probably screw it up. When visiting a family for dinner, their daughter did a traditional coffee ceremony for us. All of the cooking for this ceremony is done on a small charcoal burner. Here, she is roasting the coffee beans. 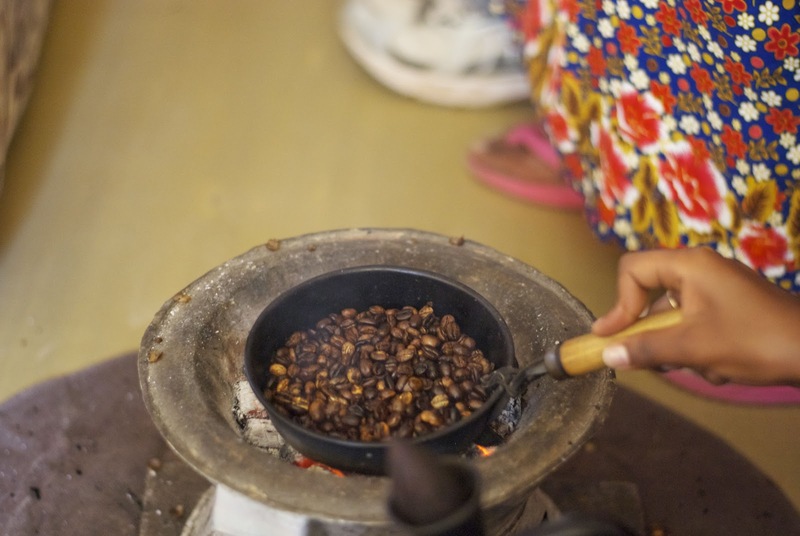 After roasting, the beans are pounded to a fine powder before being carefully measured into a special coffee pot. The coffee is brought just to a boil three times then allowed to settle before being served in dainty ceramic cups. All of the coffee I had there was better than anything I've ever had at a coffee place like Starbucks. There was never even the hint of any bitterness. 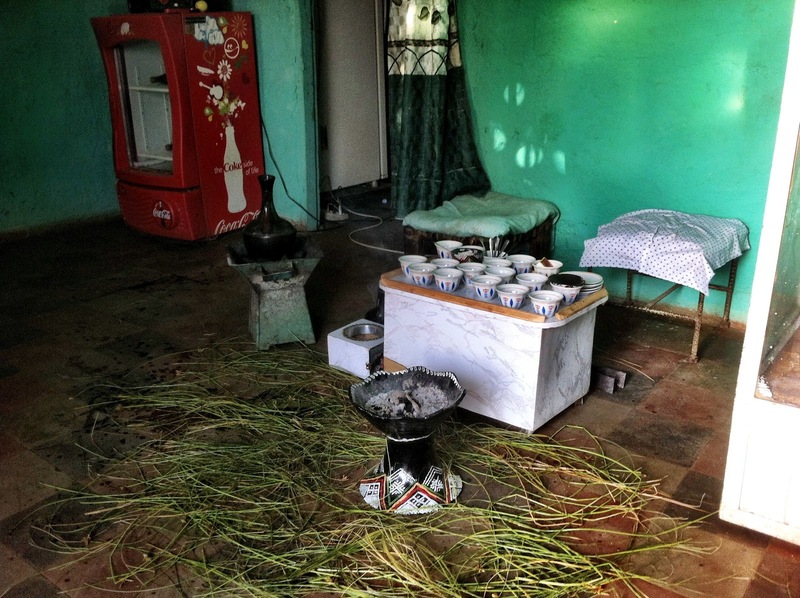 The coffee ceremony was repeated for us at many of the homes we visited even in the poorest areas of town. It takes time to do the preparation and serving so there is plenty of time to visit. This is a shot of a coffee shop that we stopped at before breakfast. The charcoal burner is on the left of the small cups. The one in front was for incense. The grass was spread to make it feel more inviting and added a nice aroma when you walked on it. 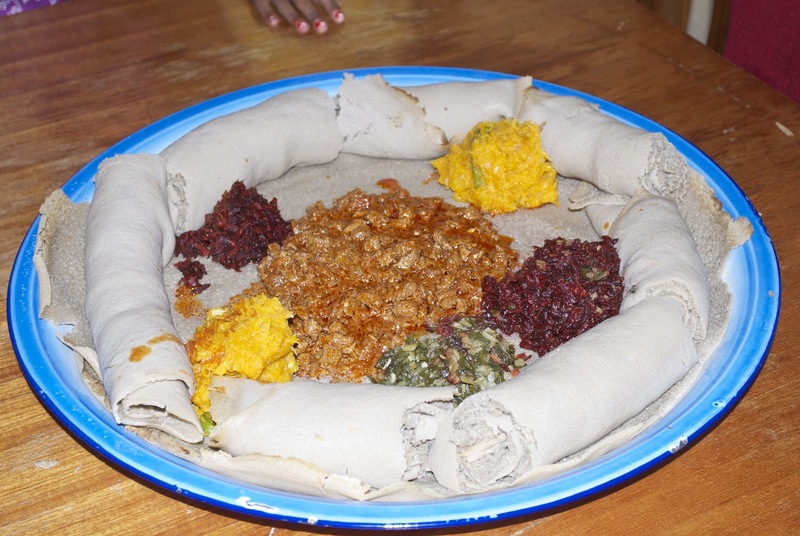 The rolls of flat pancake-like bread are called injera and it is the national dish of Ethiopia. It is made from a grain called teff and had a wonderful sour taste like a good sourdough pancake. 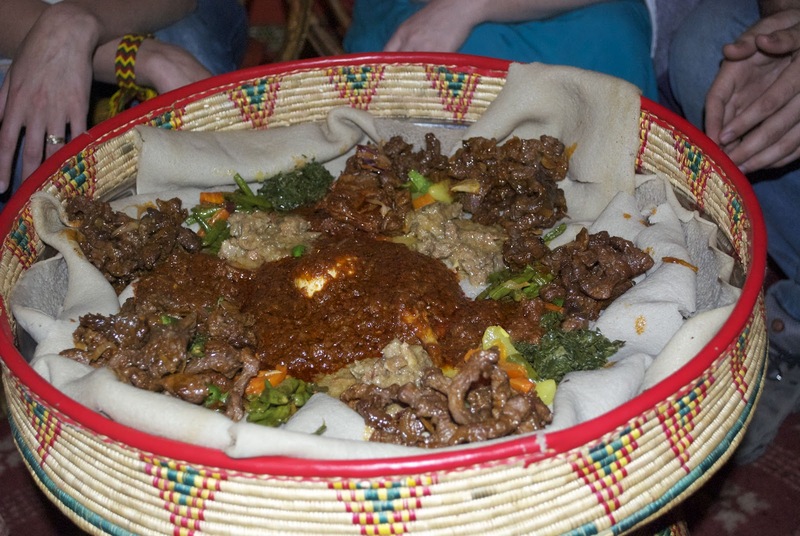 At this meal, it was served with meat in a spicy red sauce with the color coming from the spice mixture called berbere. This mixture of spices can vary from cook to cook and family to family is is made of paprika, chili, garlic and maybe 10 to 15 other dried spices. Most of the rest of the items were vegetables such as beets, kale and squash. All very good. I had to really limit myself especially with the injera and sweet vegetables and fruit. While we were in a much more remote part of the country, the only protein readily available in one restaurant was eggs. 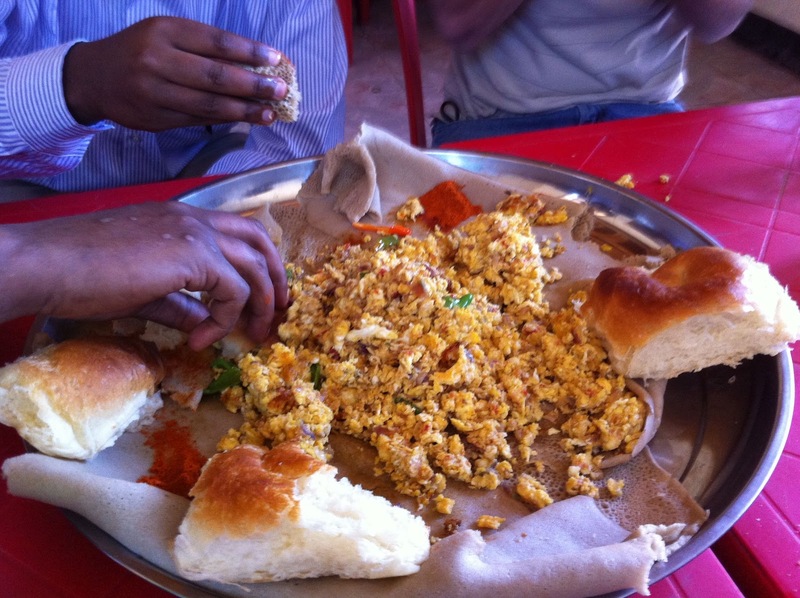 This is scrambled eggs with peppers and onions served with injera and rolls. To eat, using only your right hand (even if you are left-handed), you get some bread or injera and scoop up a bite. No utensils. Before and after eating, they bring by soap and water so you can wash your hand (singular). This dish was very good and was lunch for five people. On the way to the airport, we stopped at a hotel and had a traditional dinner. This basket/table was about 0.5m across and had about eight different items in it. Including chicken, ox, fish, goat, eggs, goat cheese, carrots, potatoes, kale, and more stuff that I didn't recognize or remember. This was dinner for eight though some in the group had started to grow tired of the taste of the food. I like spicy and rarely get a chance to try things like ox and goat at home. I must admit that most of the meat dishes generally tasted very similar. I was surprised to see spaghetti on the menu. I guess pasta is a popular dish here as it is in other parts of the world. And dried pasta was sold in many of the stalls in the market. I did try the spaghetti with tuna and it is, as it sounds, spaghetti pasta with a spicy red sauce with canned tuna meat on the side. Since I like canned tuna, I would call it good but others in our group didn't care for the concept. If you look at the meal prices, please remember that the exchange rate is 17.3 birr to the dollar so most of these meals were just over a dollar. A real bargain. Just in case you aren't wowed by the coffee, Coca Cola is readily available in the familiar bottles. The bottles are refilled at a local botteling plant. I can't vouch for whether the flavor is any different than what is locally available but it does seem to be popular. Diet Coke or any other sugar free product is just not available so I usually enjoyed mineral water. None of the beverages are served on ice. There were no restaurant chains though we did have lunch at Kaladi's Coffee though there was no tie to Kaladi's Brothers Coffee. The meals look very colourful. I am not much of a spicey food kind of gal and not totally into eggs either, so I am not sure how I would fare there. The food does look delicious though. Not spicy really does limit choice. The vegetables were very good and generally not spicy at all. I don't have any pictures but we frequently had a carrot, onion and potato dish that was very good. I would attribute that partially to the sweetness of the carrots and onions. To me, San Francisco, New Orleans, Los Angeles and Atlanta don't feel very safe either. What a great in-depth description of the food. I love spicy food, but as a vegan I think I might be out of luck protein wise. Although with all those tasty fruits and veggies at the market and fresh coffee, I think I's survive. I didn't mention it but a variety of lentils were sold everywhere and served with most meals. For much of the population, it is the primary protein source. In the sixth photo, the yellow is squash with white lentils. Yumm! So I wouldn't waste away. Yeah, like we have any worry of that happening. Great info re the local food Richard...am pretty sure I'd survive there but like the others, am not wild about the really spicy stuff. As you all were avoiding the water, did anyone come down with "the trots"? Yes, a couple of people got much sicker than that. Their best guess was not waiting for dishes to dry completely before using. I didn't think that it was necessary to explain the "left hand". Hope you find some good Ethiopian food! There were a couple of left handed folks in our group and switching for this trip was a challenging. So much of the culture is in the food ... I could almost taste the spice and smell the roasting coffee beans from the photos. Our whole house still smells of the berbere and coffee every time I open up the ActionPacker. Interesting stuff. 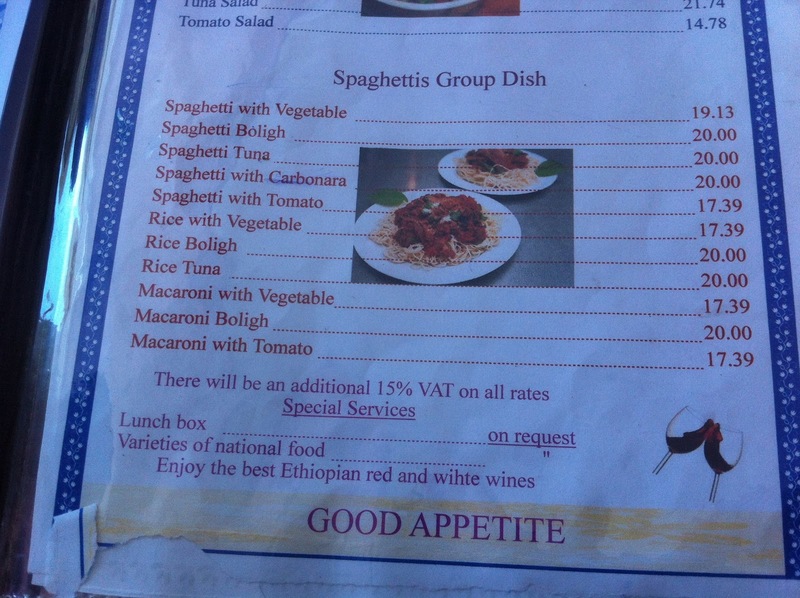 Ethiopia was an Italian colony during World War Two ( Italy invaded from neighboring Eritreia in 1936)and thus Italian foods are seen there as in other former Italian colonies, Somalia and Libya. Most of the stoves and refrigerators we saw there were from Italy. I had assumed that it was one of the cheapest places to ship from. The Italian food was a nice option and others were impressed by the pizza. A whole lot better than what we get in Alaska. 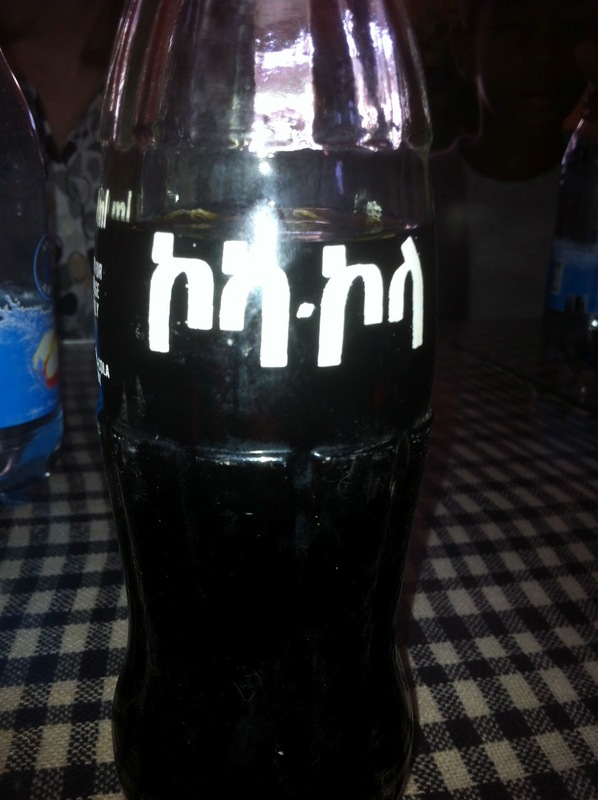 I had to go back and read all of your Ethiopian trip adventures -- it's extremely fascinating. The information is interesting, a bit depressing, but a great reminder about how good we've really got it. I immediately thought about how dangerous it must be for the mosquitos on the road, how they probably accept the risk as a part of life, and how it would be unacceptable to almost anyone in the western world. I like the food post the best, though. Really cool. Thinking of buying and roasting your own coffee is absolutely enthralling. That is the 'Turkish' coffee method, right? (I don't know about the home roasting) I wound up with a Turkish coffee pot in a gift exchange this year, and they use finely powdered coffee and it's supposed to be one of the (if not THE) oldest methods of coffee prep in the world. Same dainty ceramic cup, too. Neat. Strange to think how much of the world lives in these conditions. Where meat (seems to be) an luxury and water is undrinkable. Thanks for sharing. I could ramble on, but I think I should just stop and say, good for you. What a great thing for someone to do. The mosquitos were an issue at the lower elevations. This is their dry season, evidenced by our not seeing a single cloud until the last day. The rainy season is July and August and the rain comes every afternoon in torrents. Most places had huge gutters along the street to handle the water. The coffee was ground to a powder before putting it into the pot. If you like strong coffee, this is a good way to make it. Just about everyone used quite a bit of sugar in their coffee. No artificial sweetener or milk so I had it black most of the time.